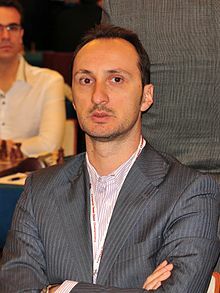 Veselin Aleksandrov Topalov (pronoonced [vɛsɛˈlin toˈpɑlof]; Bulgarie: Веселин Александров Топалов; born 15 March 1975) is a Bulgarie chess grandmaster. Topalov acame the FIDE Warld Chess Champion bi winnin the FIDE Warld Chess Championship 2005. He lost his teetle in the Warld Chess Championship 2006 match against Vladimir Kramnik. He won the 2005 Chess Oscar. This page wis last eeditit on 9 November 2015, at 19:21.